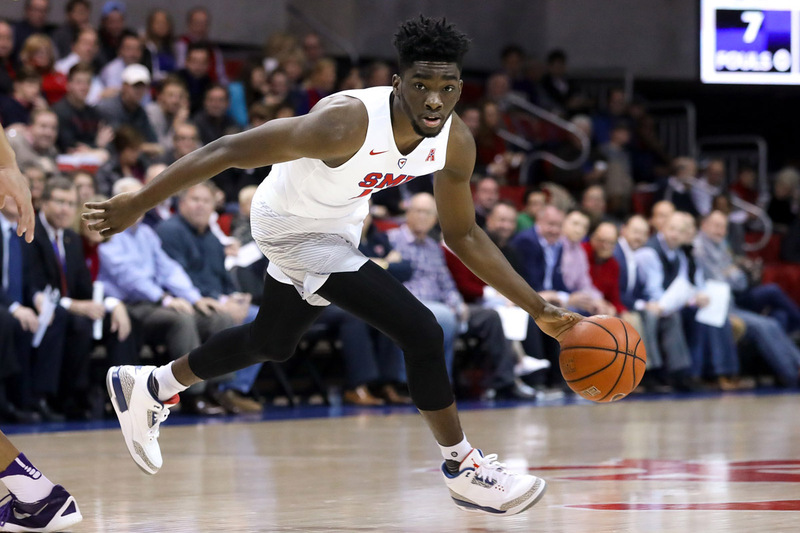 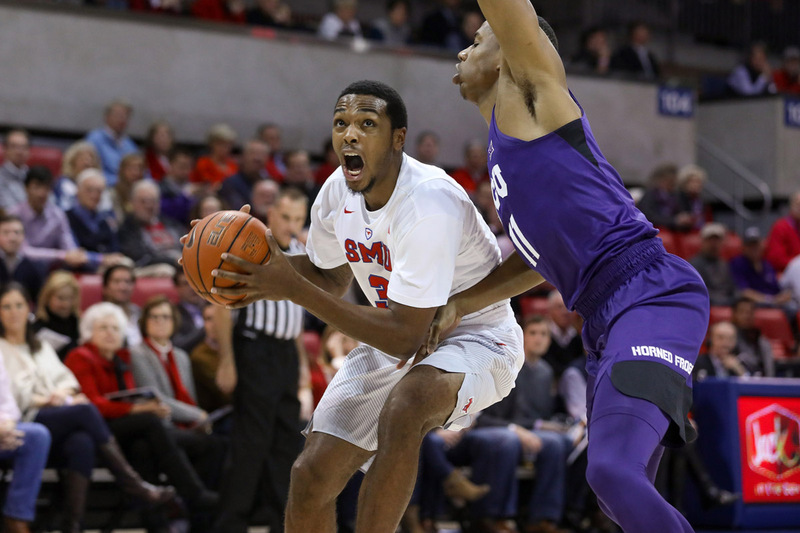 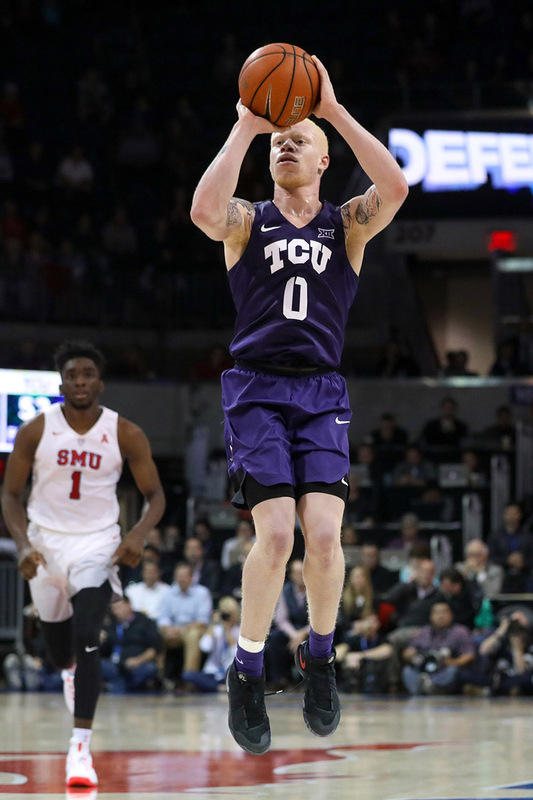 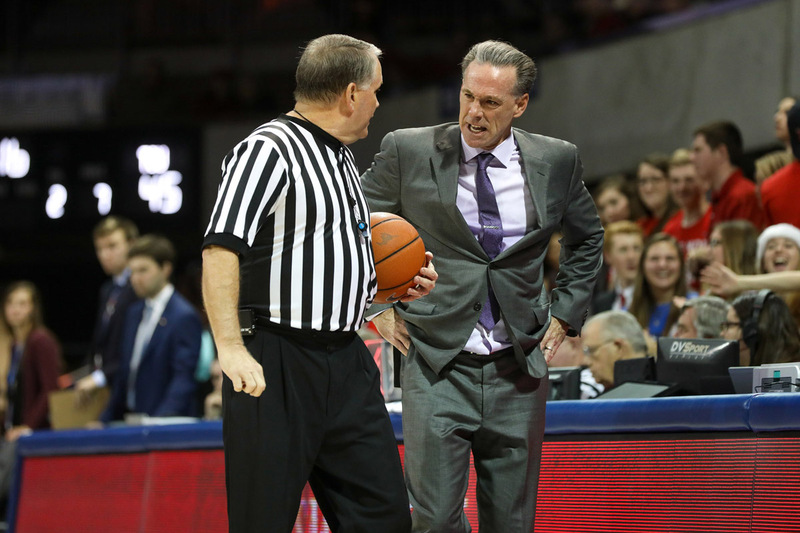 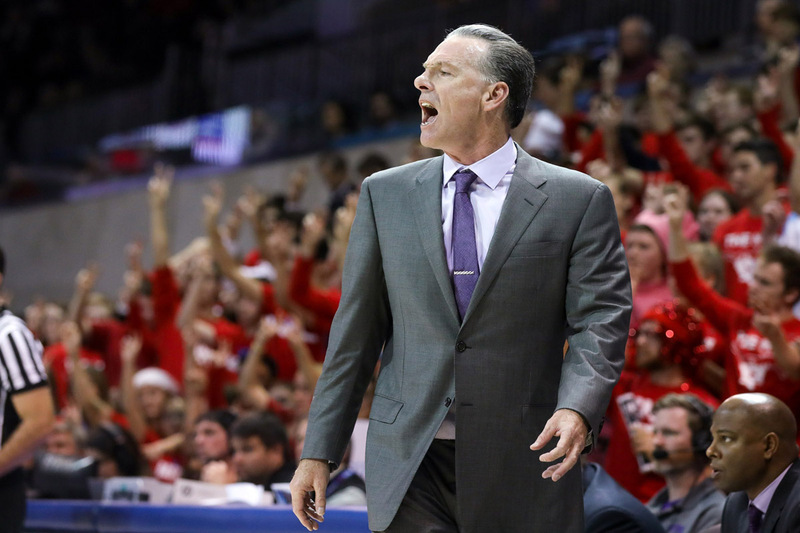 SMU Men’s Basketball Scores First Signature Win Under New Coach Tim Jankovich With Victory Over Jamie Dixon’s TCU Horned Frogs. 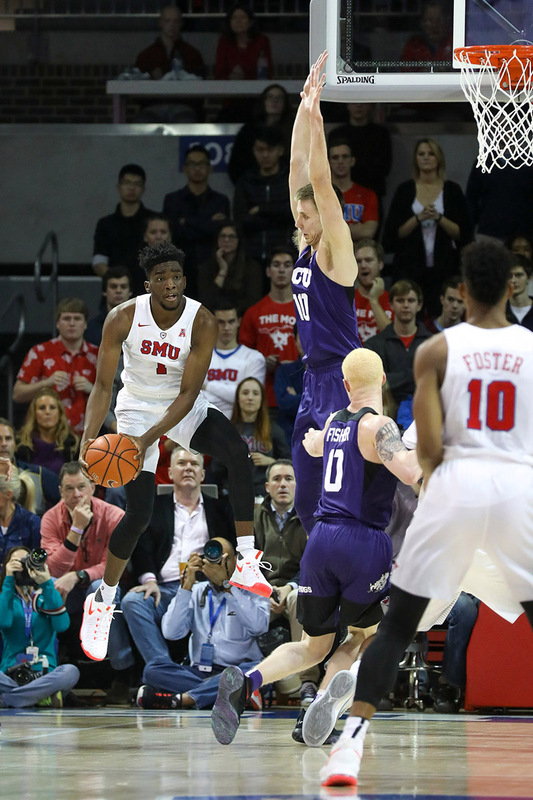 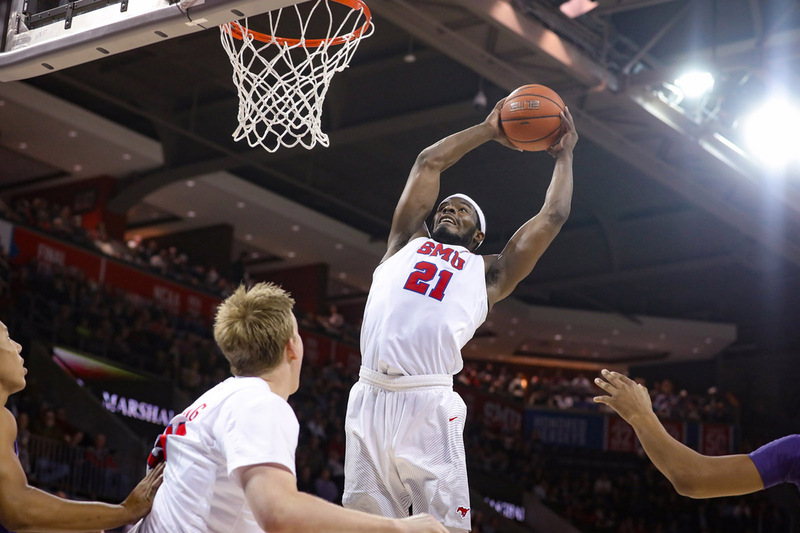 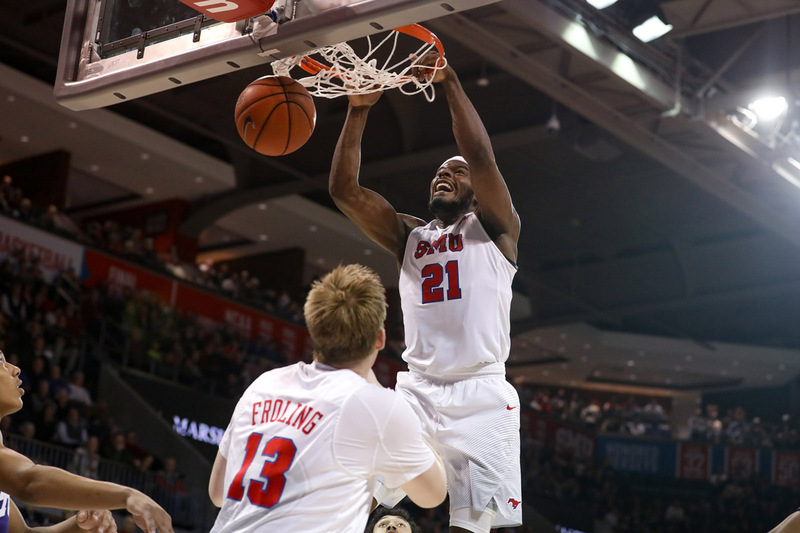 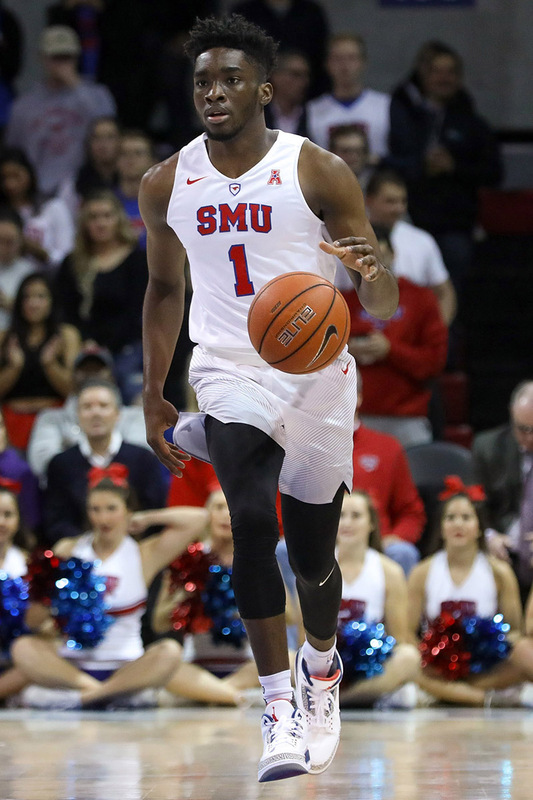 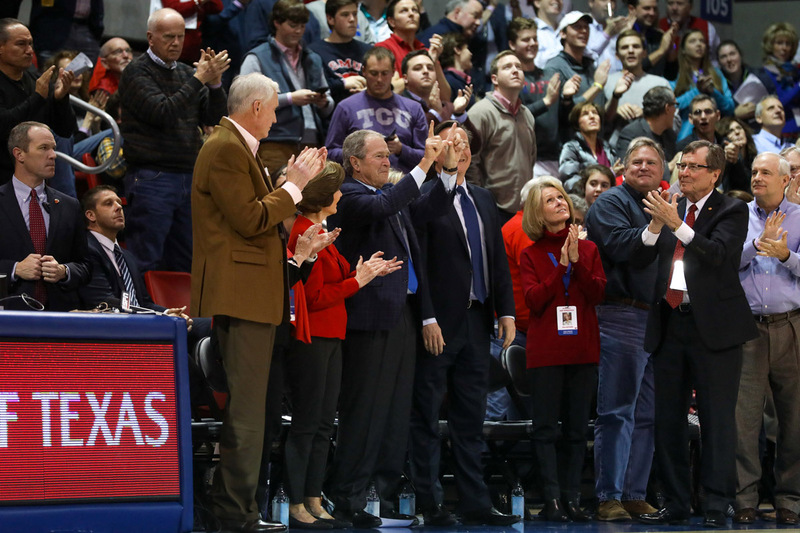 Last night’s 74-59 SMU win over cross-region rival TCU was a much-needed one. 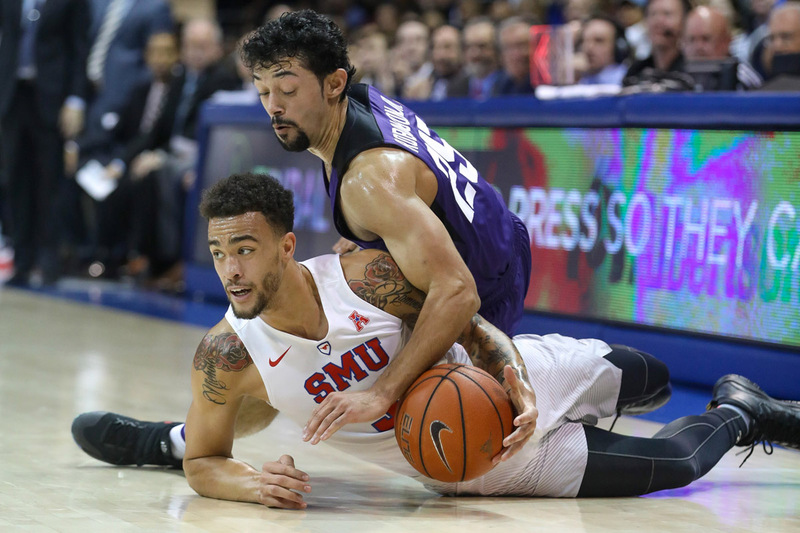 Early as it may be in the college basketball season, a sense of urgency still loomed heading into the game for the Mustangs, who are reeling from a tough non-conference preseason schedule that has included road losses to Michigan, USC and Boise State. 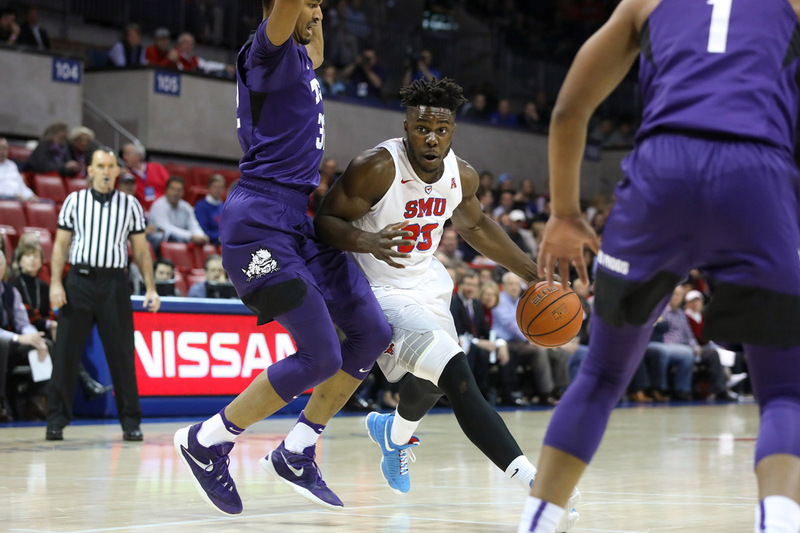 Junior forward Semi Ojeleye certainly understood that. 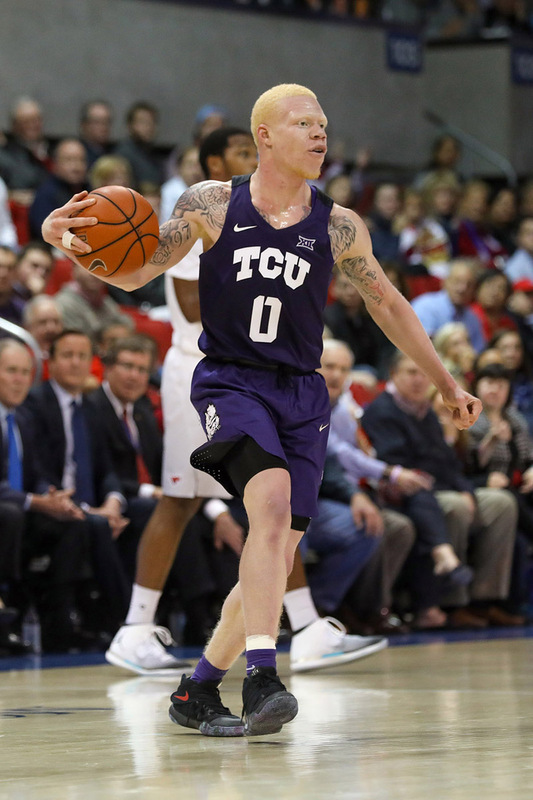 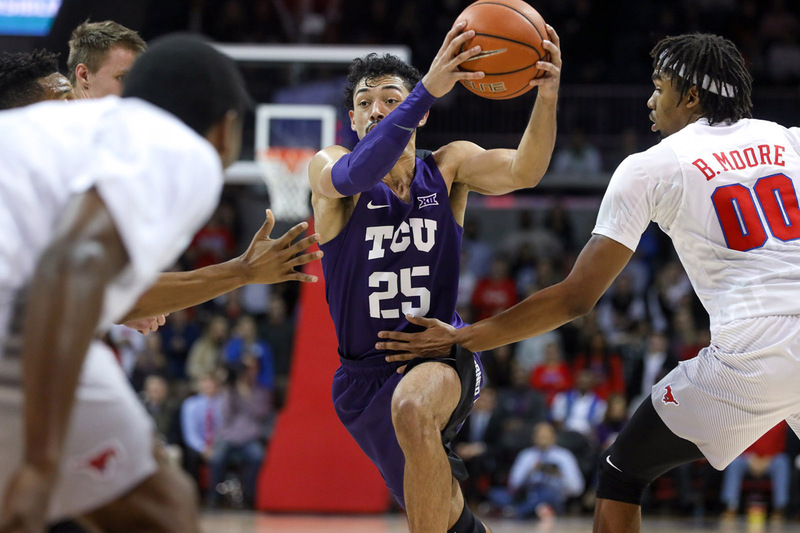 The TCU Horned Frogs — led by new head coach Jamie Dixon, formerly of the University of Pittsburgh — were undefeated (8-0) coming into Moody Coliseum on Wednesday night, averaging a staggering 18 forced turnovers and 82 points per game. 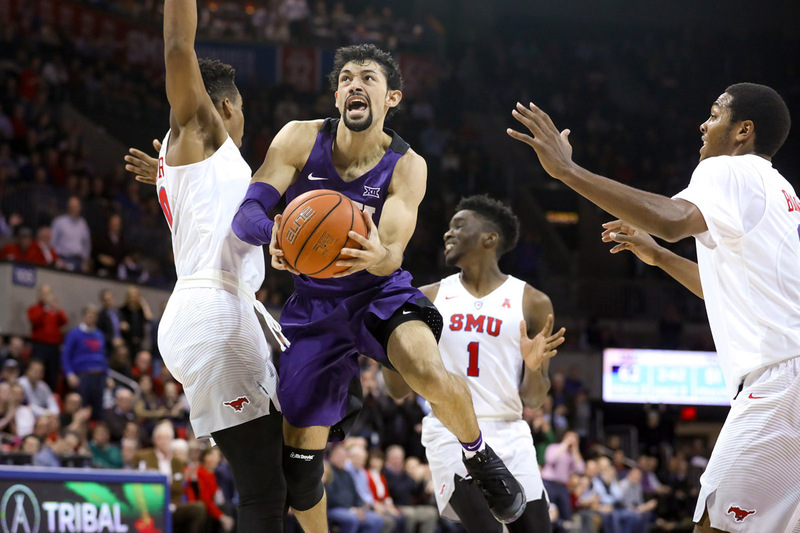 But the Mustangs protected the ball well in the contest, only giving it up five times while put enough pressure on the Horned Frogs scorers in half-court presses to keep control of the game, which SMU led from the opening minute on. 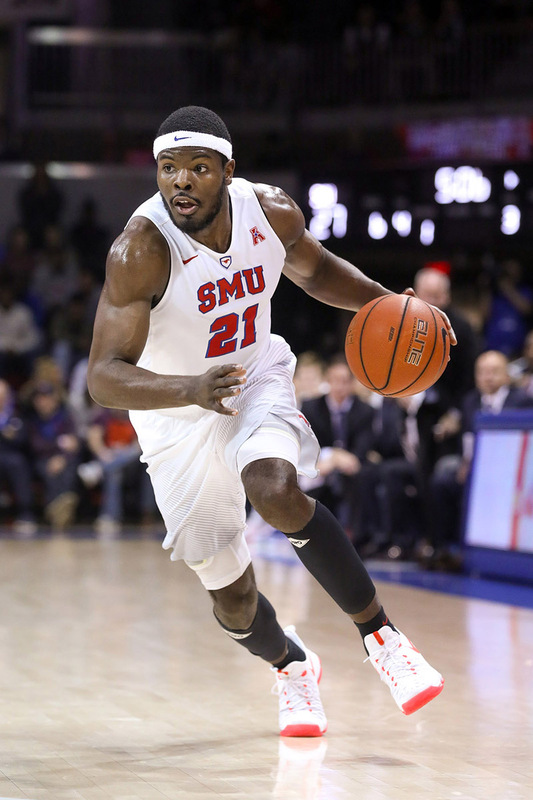 Ojeleye carried the Mustangs with a team-leading 23 points and 7 rebounds, while also adding three assists and two blocks to his ledger. 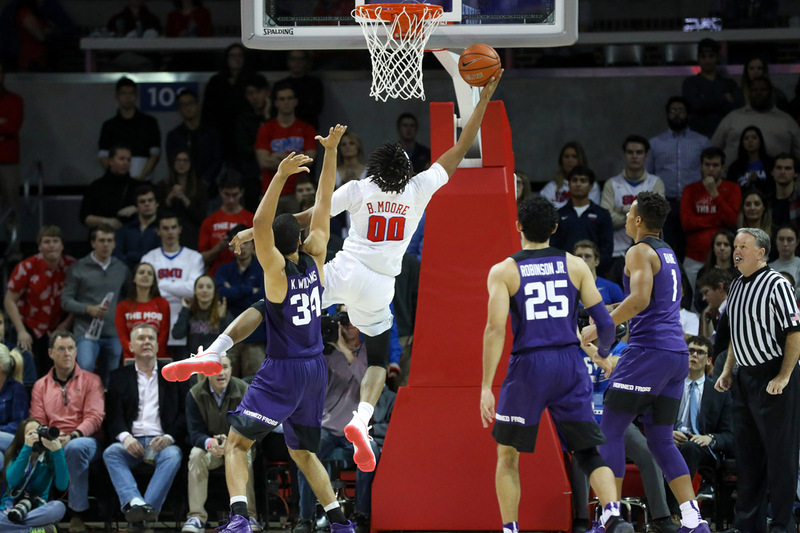 The 6’7” forward scored at will, whether from the three-point line, through slashes to the basket or by posting up bigger defenders under the hoop. 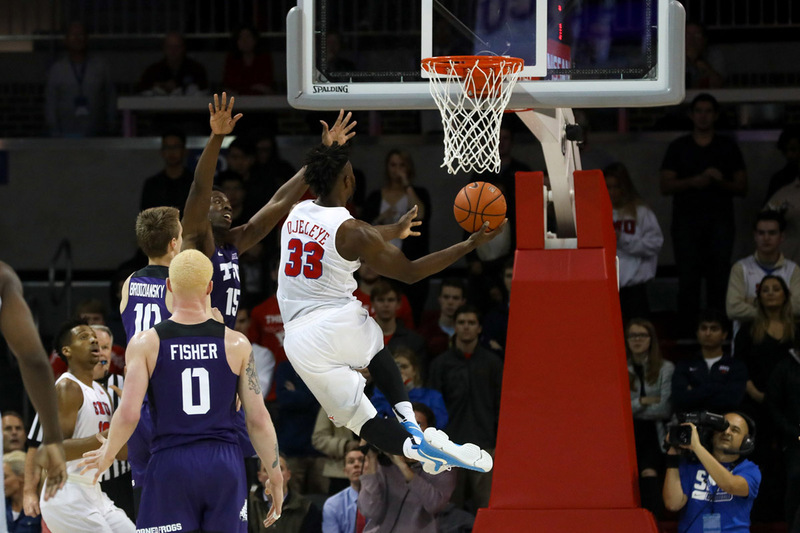 Sophomore point guard Shake Milton added in 17 points, too. 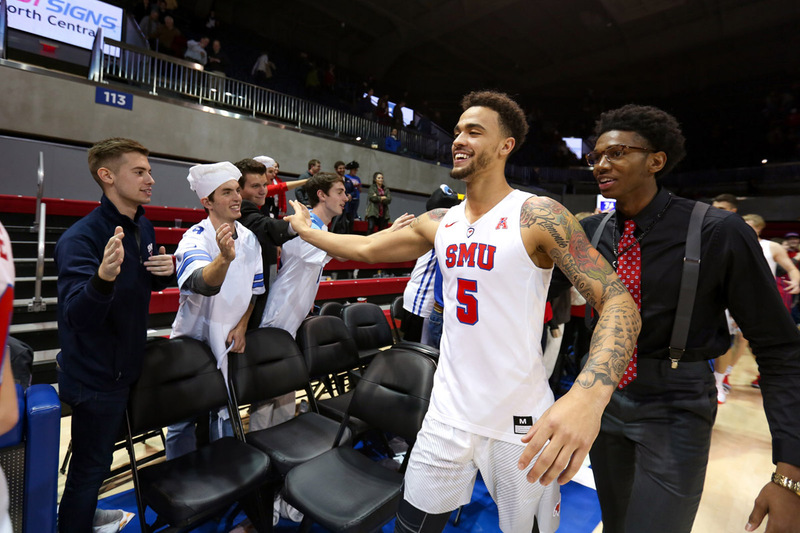 But one thing remains clear following the departure of influential seniors like Nic Moore and Markus Kennedy from last season: This young team, boasting eight underclassmen, lacks vocal leadership. 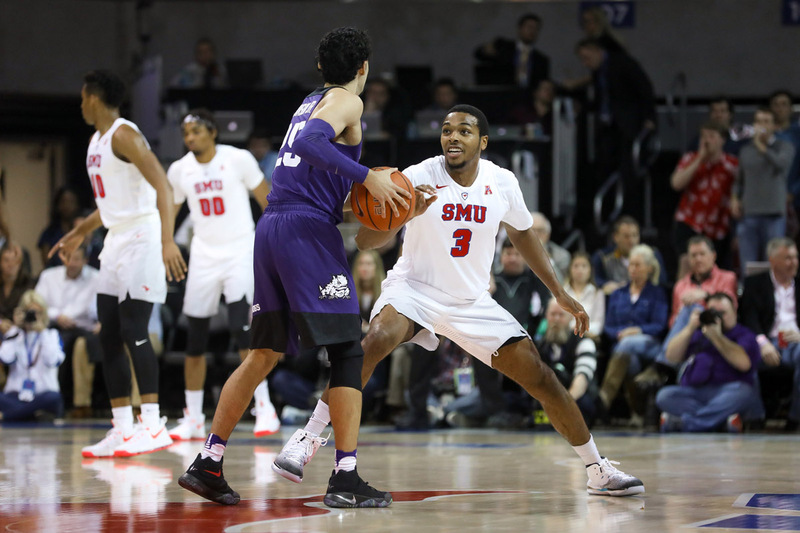 Milton hardly looks in control of the offense, and during tough foul calls or after giving up easy baskets, the team looks uncertain in team huddles and during other moments when leaders like Moore or Kennedy used to rally everyone. 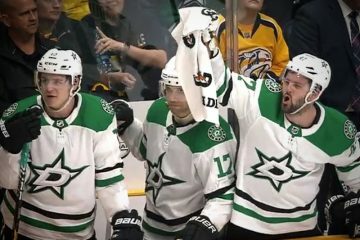 Instead, this team is leading through its actions. 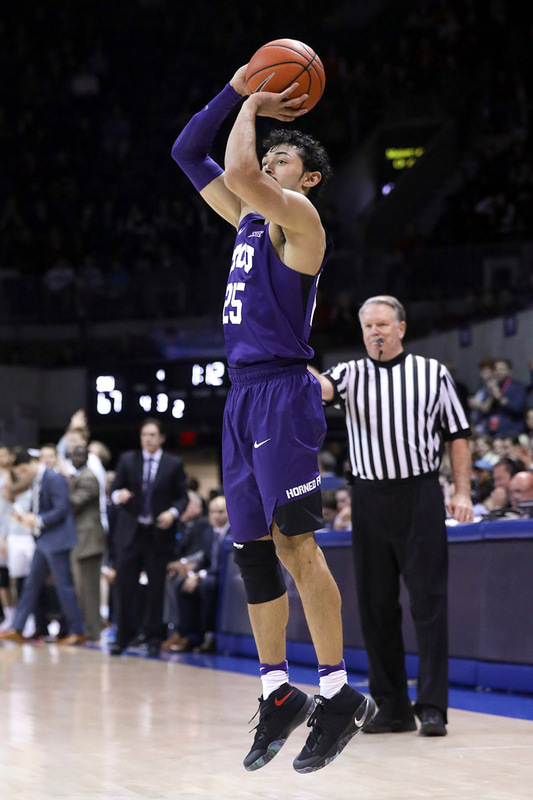 Late in the first half, with a little over two minutes left and a dwindling 29-26 lead, junior guard Ben Emelogu threw down an inbound alley-oop pass that sent Moody Coliseum into hysteria; from that point on, the Mustangs embraced the crowd’s energy and kept the Horned Frogs at bay — so much so that senior guard Sterling Brown went so far as to give Emelogu a shout-out for his dunk during the post-game presser. 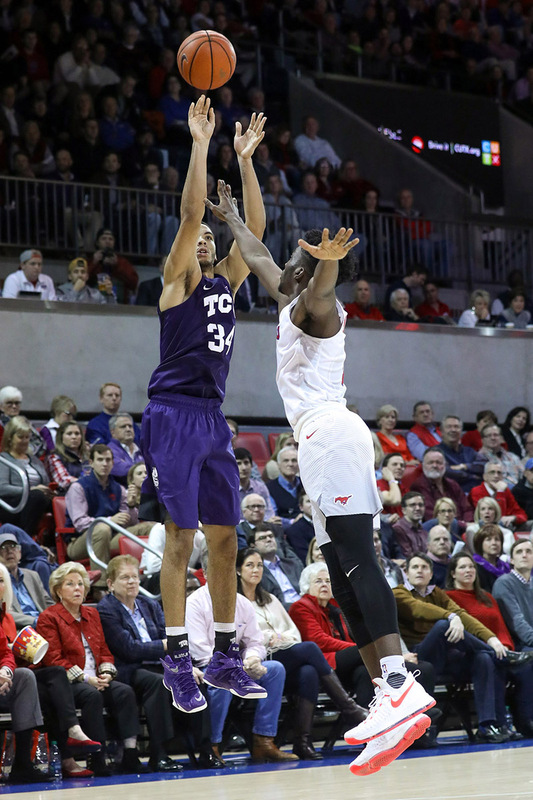 The win over TCU was a confidence-boost for a young, developing team. 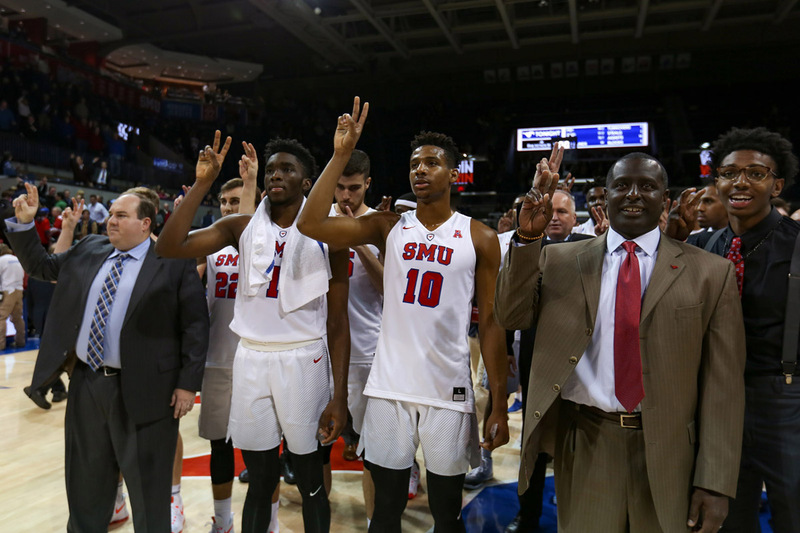 As new head coach Tim Jankovich put it after the game, he’s still working on ways to utilize this group of athletes. 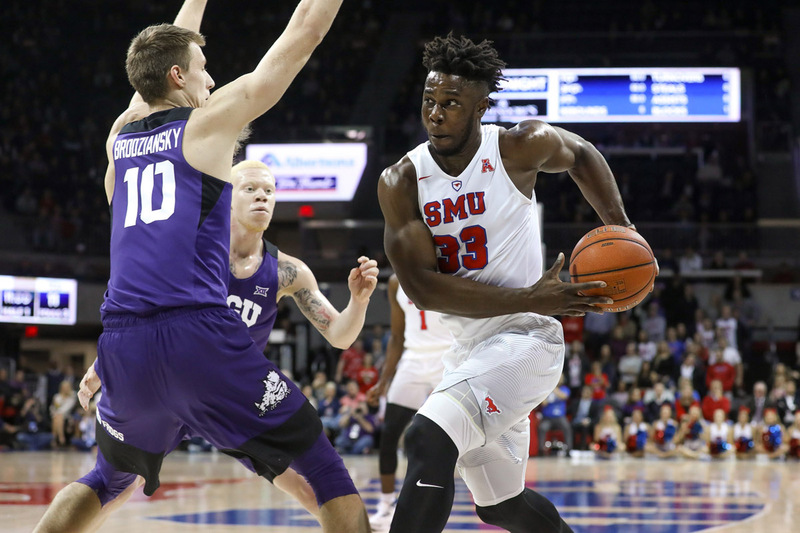 While working as the associate head coach under Larry Brown last season, SMU rolled out a “traditional” team, as Jankovich put it, with tall post players and a small athletic point guard running the offense. 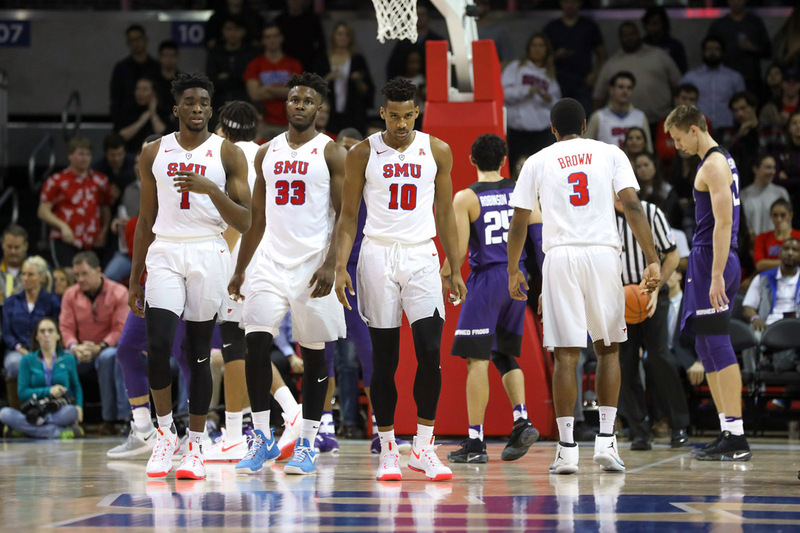 This year’s crop of players is a new challenge: Nearly every player in the starting lineup is within two inches of each other, standing between from 6’6” and 6’8”; traditional roles can’t really exist with a lineup like that. 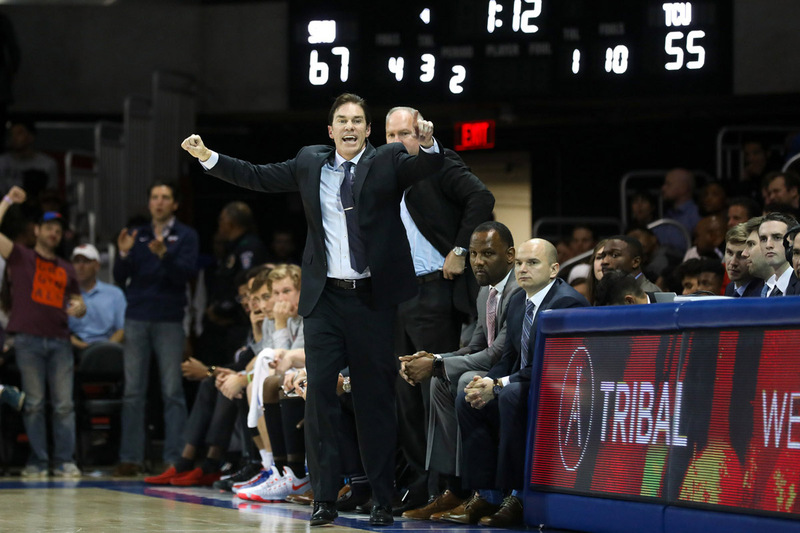 Going forward, this unconventional team will have to keep learning to play together, and Jankovich will be forced to find ways to make this team difficult to play against as he embraces the opportunities the lineup presents. 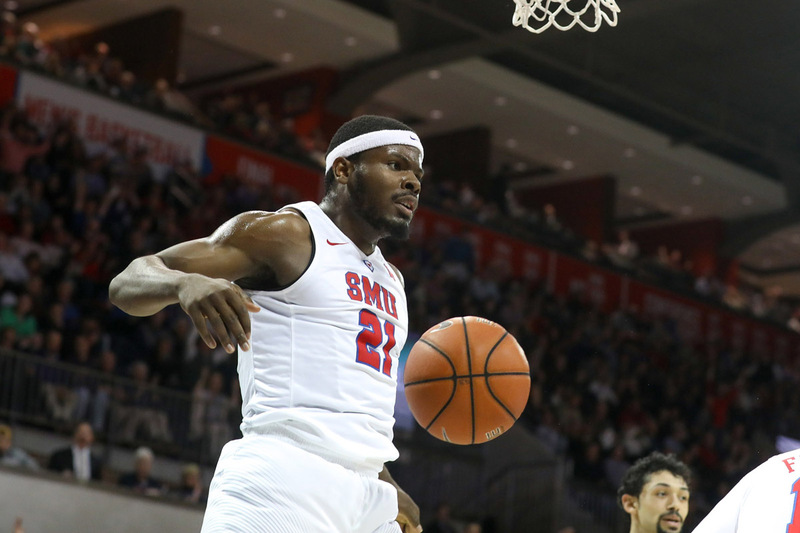 Unfortunately, the tough non-conference schedule isn’t over yet: Stanford visits Moody Coliseum later this month. 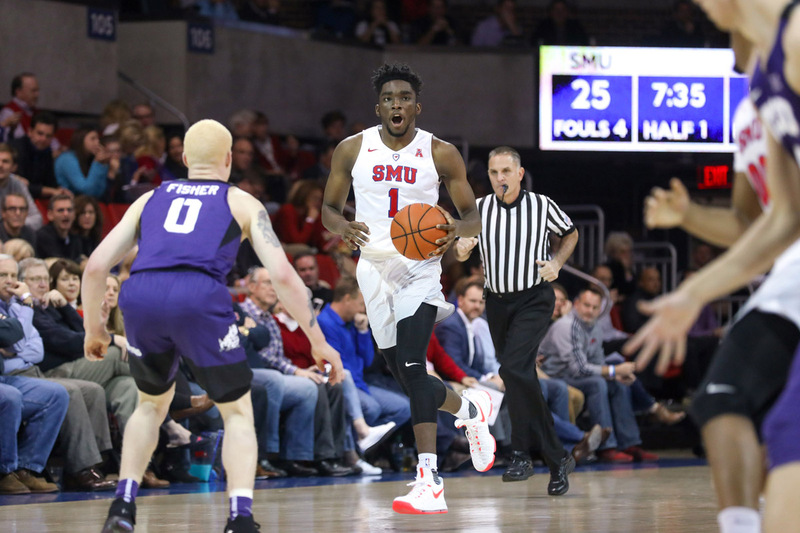 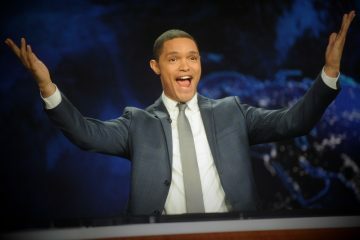 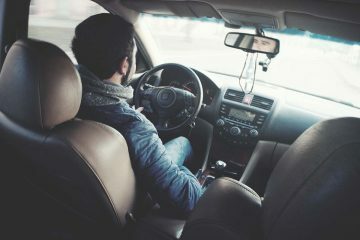 The good news? 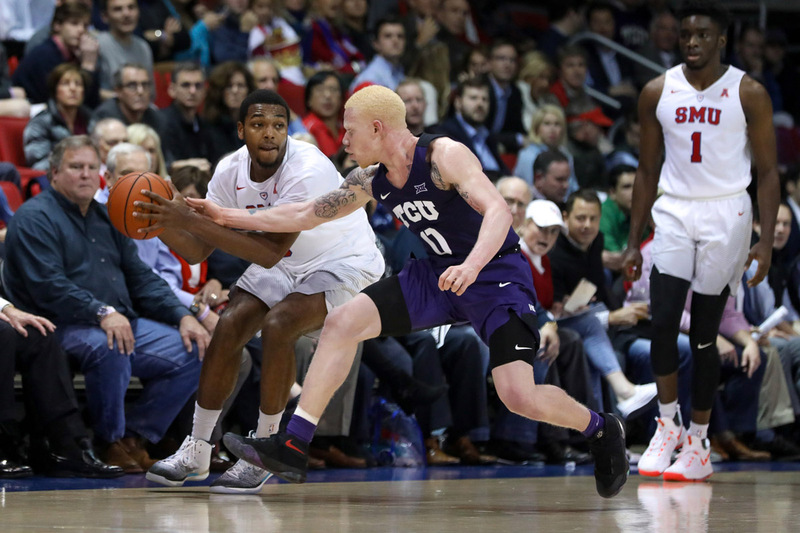 The Moody advantage is still a factor. 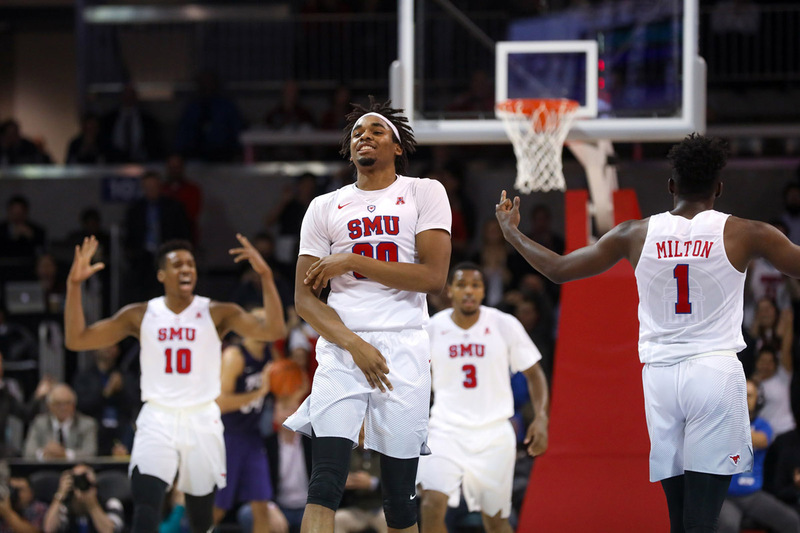 SMU is 6-0 at home this season.